I was introduced to Nashville, Tennessee, when my cousins moved there several years ago. Nashville has a charm and beauty to it that I never knew existed prior to that first visit. Without a doubt my favorite part of Nashville is the time I get to spend with the cousins. However, there is something my cousin Jackie introduced me to that has become a close second; Colts Chocolates. 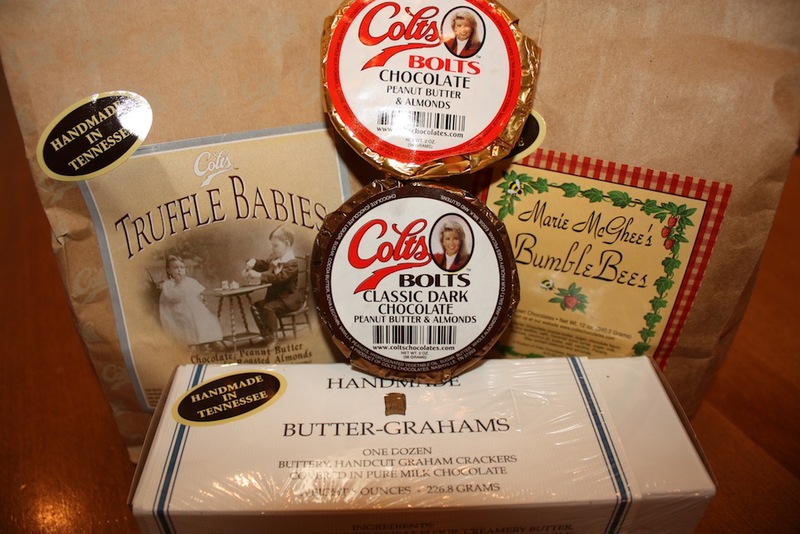 Colts Chocolates is Nashville based, founded by Mackenzie Colt. There are many facets to Mackenzie’s story that I find fascinating. She married at 15, worked to put her husband through college and law school and became a Hee Haw girl – a country singing series on television, never thinking that one day she would run a successful business. Throughout all the years Mackenzie would bake treats and give them as gifts to friends during the holidays. Mackenzie, ultimately, started Colts Chocolates in 1984 and the business has grown substantially ever since. There are several products that Colts Chocolates makes and I have a hard time sharing them with others. Colts Bolts are peanut butter cups that have been supersized in a wonderful way. They start with a layer of chocolate, which is topped with a ton of roasted almonds that are covered with a peanut butter layer and then topped with more of that delicious chocolate. Whereas I normally gravitate toward all things dark chocolate, I actually can’t decide if I love the milk or dark chocolate Colts Bolts more. Fortunately, they are available through mail order so I may order both and avoid the conflict. The Truffle Babies are similar to the Colts Bolts, but the truffles incorporate the roasted almonds into the peanut butter and then the scoop of this mixture is covered completely with milk chocolate. The truffles are more along the lines of what I call ‘poppable’ foods because I just pop them in my mouth. It was after eating the truffle, but before diving into the Bumble Bee, that I turned the package over to see who makes that wonderful treat. I was not surprised to see Colts Chocolates listed and was pleased as punch to have the opportunity to try more of what they offer. I loved the story behind the Bumble Bees. Marie McGhee was Mackenzie Colt’s mother who adored these candies. Marie passed away before Mackenzie incorporated them into her lineup, but I love that Mackenzie named them for her mom. Bumble Bees are made with milk chocolate, buttery caramel and slow-roasted pecans that crunch when you bite them. They are a fabulous turtle option. The last Colts Chocolates discovery I made were their Handmade Butter-Grahams, buttery handcut graham crackers covered in milk chocolate. I was a bit skeptical at first, based upon my disappointment with so many graham crackers available in the stores. Well, let me tell you, Mackenzie has mastered graham crackers. These treats have the heavenly scent of a graham cracker and the taste is spot-on. Don’t just take my word for Colts Chocolates; order your own. They are available online or through mail order. I am confident you will check out their website and have as much trouble choosing as I had. I am so with you Kim!